The microprocessor based RHCN-7000 Series on/off controller provides control for humidifying or de-humidifying. 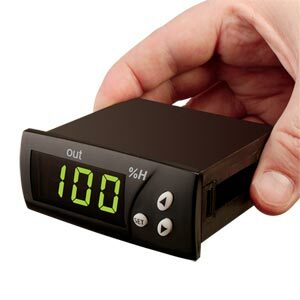 Relative humidity, output status, and error messaging can be viewed on the bright green LED display. The controller features user defined parameters including setpoint, hysteresis, control type, and probe adjustment. Access to programming parameters can be locked for security purposes using the password protection feature. Select RHCN-7000 models can be interfaced with most RH transmitters that provide a 0 to 1 Vdc or 4 to 20 mA output, or an optional RH probe, model RHCN-7000-RP can be ordered to work with 0 to 3 Vdc input models.